The long, hot days of summer are right around the corner. Cookouts with friends, play dates at the pool, and visits to the coast are within our reach. And with the summer days comes another convenience we can look forward to, the ability to stay cool inside of our homes. Thanks to our Greensboro air conditioning systems, we can enjoy fresh and cool air throughout the entire summer. This was not always the case, and at Carolina Fuels, we would like to take you on a trip to learn how air conditioning has helped our country become a better place. After all, with today’s modern appliances and homes, it is easy to forget just how important air conditioning is to our comfort in the heat of the summer. Just as laptops and cell phones are imperative in our society today, so is the use of air conditioners to cool homes and office buildings. If you find that you visit movie theaters more often during the summer months, you are not alone. It’s refreshing to sit in a highly air conditioned theater to cool off from the heat and enjoy a great film. That is why a lot of the summer blockbuster movies are released, since producers know that there will be a higher percentage of moviegoers during this time. If you have a home theater in your house, you can create the same environment of a larger theater by providing excellent air conditioning, not to mention the buttered popcorn. If your Greensboro air conditioning system is not working as efficiently as it used to, contact Carolina Fuels to do a diagnostic evaluation to see if a cooling repair or replacement is necessary. Our knowledgeable and trained technician will inspect your HVAC system. If a replacement is needed, we offer high efficiency air conditioners that will provide refreshing comfort with cost savings on your utility bills. 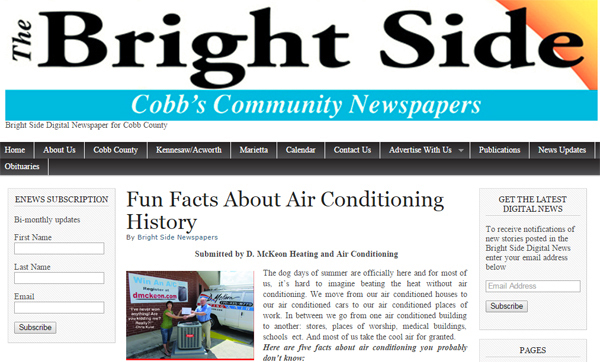 Beside helping the film industry, did you know that air conditioning helped the U.S. government? Politicians and government employees are working harder for our country, now that air conditioning is the mainstream for cooling large, commercial buildings and homes. No more long vacations for the federal government, they work throughout the summer with their central AC system working at full capacity. If your commercial building is not cooling properly, or you are ready for an upgrade, call Carolina Fuels for a service visit to restore your system to peak performance level. Or, we can measure your square footage, examine your ductwork, inspect your vents, and provide you with information on Greensboro air conditioning systems that are within your budget and efficiency needs. Our installation team offers convenient scheduling, so your business will experience minimal downtime to have a new air conditioner installed. Looking for a cool idea this summer? Cool off with top brand air conditioning systems, maintenance, and repairs at Carolina Fuels. The Southeast has a long warm season, and it is essential to be prepared for it so you can enjoy every minute. Contact us at 336-623-9741 for high quality HVAC service in the Greensboro area.